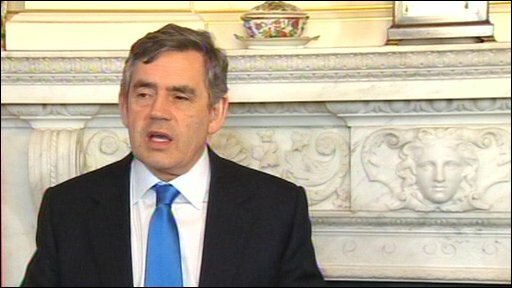 Gordon Brown has offered his support for Home Secretary Jacqui Smith as she continues to come under pressure over her use of parliamentary expenses. It has emerged she "mistakenly" claimed for two adult films watched by her husband, as part of her allowances. Mr Brown said this was a "personal matter", which ought not to "detract" from her "great" work. Figures for MPs' allowances published on Monday showed that she claimed £157,631 in total in 2007/08. Ms Smith has said she "mistakenly" claimed £10 for the two films, which her husband Richard Timney watched in April 2008, when billing the authorities for her second homes costs. She is already being investigated by the Parliamentary Commissioner for Standards over her decision to charge at least £116,000 in second-home allowances for her constituency housee in Redditch, Worcestershire. The Tories said the expenses claim for the films was "embarrassing" but not a resignation issue on its own. Despite Mr Brown's backing for her, Labour backbencher Paul Flynn said the home secretary should step down, as her authority had been "badly damaged". Liberal Democrat MP Greg Mulholland said both Ms Smith and work minister Tony McNulty should resign for "bringing Parliament and the government into disrepute". Ms Smith did not see the films, which were watched by her husband at the family home in Redditch, but was said to be "mortified" by the error. The home secretary said she had claimed for a TV package when billing for a web connection under her second homes allowance and would repay the money. MPs can claim for subscription television services but they have to be used wholly, exclusively and necessarily to perform their duties. Mr Brown told a Downing Street press conference: "This is very much a personal matter for Jacqui. "She has made her apology. Her husband has made it clear that he has apologised. "I think the best thing is that Jacqui Smith gets on with her work, which is what she wants to do." He added: "The home secretary is doing a great job and in no way should this issue be allowed to detract from everything she is doing for the public in making our neighbourhoods safer." Ms Smith uses her allowances to employ Mr Timney as her parliamentary aide in a role which can carry a salary of £40,000 - although her office said he was paid "much closer to" the £20,000 end of the range. She says she did nothing wrong as she had approval to say her main home was her sister's house in South London, which she shares. Conservative leader David Cameron said: "I think she has got some questions to answer about the second home issue. It does seem to me pretty incredible to claim that the home where her family is, that is not her main home." "I think this goes to a deeper problem which is the second home allowance for MPs. The prime minister has ordered a review but he has sort of kicked it into the long grass," he added. He said there was "something wrong with the culture of the system", shown by the fact that the expenses claim which included the adult movies had been approved. Liberal Democrat leader Nick Clegg said MPs should face expenses "spot checks" and complete item-by-item receipts. He told the BBC: "The system needs to be looked at top to toe... The whole of the Westminster village is in the last chance saloon. "We have a common interest in sorting this out quickly." Labour MP Paul Flynn said Ms Smith should step down. "Her reputation is in serious trouble and her authority is badly damaged and I think she should herself look at her position," he told BBC Radio Wales. He added: "I don't see much point in her continuing in high office now." Ms Smith said in a statement: "I'm sorry that, in claiming for my internet connection, I mistakenly claimed for a television package alongside it. "As soon as the matter was brought to my attention, I took immediate steps to contact the relevant parliamentary authorities and rectify the situation. "All money claimed for the television package will be paid back in full." Mr Timney has apologised for embarrassing his wife. The latest House of Commons figures, released on Monday, show Ms Smith claimed £22,948 in second home allowances in 2007/08 - just under the £23,083 limit. The independent Committee on Standards in Public Life has previously announced a wide-ranging review of MPs' pay and allowances, which is due to start later this year. The prime minister said he had written to the committee on Monday to ask it to look into a number of "specific issues" and to urge it to report as soon as possible. "Public scrutiny of members of Parliament is a necessary element of our democracy," he said. "I believe we are doing everything in our power to make sure we bring what is a better system than the one we inherited for the years to come."